The eagel has landed, all TJM vinyls are here! 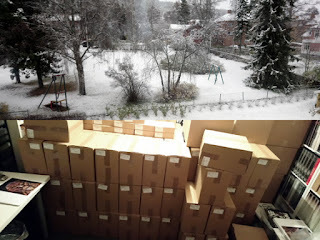 At the same time as the season's first snow, Total Jävla Mörker's complete vinyl discography and boxes also came. All the pre-paid pre-orders (dtaktochluftslott@totaltjavlamorker.com) of the "DÖ HÅRT" box set version will be shipped out next weekend. Everyone else has to wait until December 1st. Right now, I'm extremely bad at checking and responding to all your mail. Hectic weeks/months, long days and sleepless nights. In other terms, I'm taking care of my two kids and trying to keep my head above the water. Thats about all I can manage and cope with. We have tons of other great news coming up too. Really excited about this! Just wait and see. We'll go back to normal, taking orders etc, in Dec/Jan. Over and out.